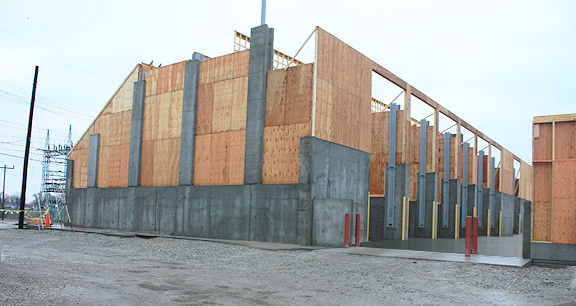 Project obstacles and solutions: In March 2015, Premier Companies announced that it would replace and expand its dry fertilizer building. The new seven bin storage building nearly doubled the previous capacity to 6,400 tons with the ability to expand to 10,000 tons. The company announced several upgrades in the new facility, including a declining weight system that will greatly speed up the amount of time it takes to load a truck - allowing a 16-ton truck to be fully loaded in three minutes. The old system took about 20 minutes for the same action. Marcus Construction specializes in agricultural structures. Key to the construction process was concrete that could be waterproofed for the pit area. Concrete becomes porous as extra water bleeds from a freshly poured mix. The escaping water leaves behind capillary pores where liquids can later penetrate the concrete. IMI QC/QA designed a mix that used a crystalline admixture for the concrete poured in the pit. Crystalline admixtures are carried along with the escaping water. During the curing process, they harden and close off the concrete capillaries, forming a waterproof slab. IMI supplied a total of 1,600 yards of concrete for the Premier Ag project. For more information on waterproofing concrete, contact the sales representative for the plant nearest your location. Click here.